Born and raised in New York City, Ken is now a transplanted Texan. 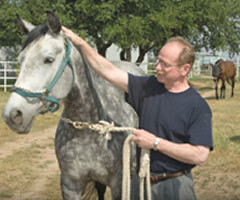 He and Mary, his wife of thirty-five-plus years, own a horse farm in San Angelo. Along with their two dogs, six cats, and eight horses—at last count!—they board and breed horses and Mary teaches English riding. She’s a therapeutic riding instructor for the handicapped, as well. Life is never dull. Their two granddaughters visit several times a year and feel right at home with the Casper menagerie. Grandpa and Mimi do everything they can to make sure their visits will be lifelong fond memories. After all, isn’t that what grandparents are for? Family and community are very important to Jesse Amorado, so when a real estate developer threatens to turn his beloved barrio into a country club for the rich, Jesse fights. He wasn’t counting on having to resist Tori Carr, the man’s beautiful daughter, in the process. When Kerry First ditched her high school prom date, she never expected him to come back into her life and offer tough love against demons they have in common. The Number One Ranch has been in the First family for generations, but Adam First’s daughter has just sold controlling interest to the bank. Now he must answer to Sheila Malone, a management consultant whose ideas on how to run an 800-square mile spread clash sharply with his. Divorcée Marcie Browder goes home to the family ranch to start over – until her father is murdered and foreman, Tucker McGee, is hiding something.